In the UK, Manufacturing is a diverse sector that encompasses large numbers of industries and sub-industries. These range from heavy industries to specialist or delicate operations. Although the number of people employed in the sector has decreased over the past 30 years, it still directly employs 2.6 million people equating to 8.5% of the UK workforce. The Manufacturing sector includes business of all sizes which span across both large organisations (43.5%) to sub-sectors dominated by micro businesses and the self-employed (34%). Each manufacturing discipline or sub-sector has its own risk profile and is required to overcome various health and/or safety hazards specific to its process. This white paper from Alcumus covers the risks of using contractors, contractor health & safety assessments, how SafeContractors work and much more. Mitigating contractor risk in the manufacturing industry Each manufacturing discipline or sub-sector has its own risk profile and is required to overcome various health and/or safety hazards specific to its process. 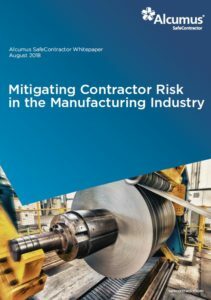 This white paper from Alcumus covers the risks of using contractors, contractor health & safety assessments, how SafeContractors work and much more.